When more than 44 million people visit every year, it’s inevitable a few things get left behind. Each year at Sydney Airport, we put lost and unclaimed items to good use at our Lost Property Auction. The money raised from the auction is invested back into our local community, supporting communities and charities who need it most. The 2019 Lost Property Auction starts on 19 August and we're inviting charities in the local area to apply for the Bid for Good grants. The areas of focus this year include arts and culture, education and employment, women and girls and community cohesion. In 2018, the Lost Property Auction raised $170,000 to support charities in the local area. 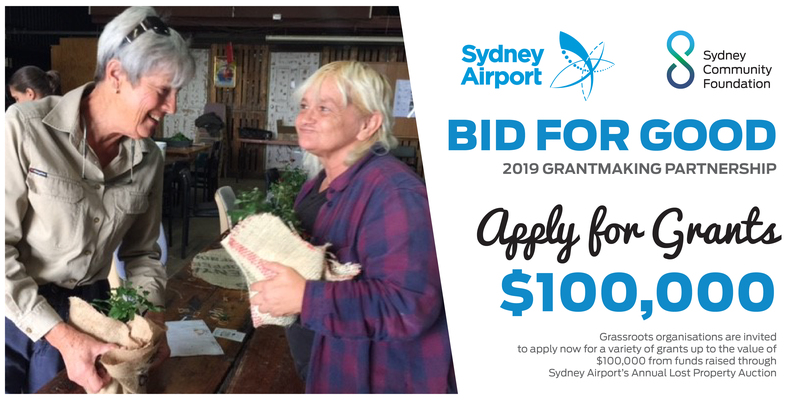 Sydney Community Foundation, established in 2004, is Sydney’s first and only dedicated Community Foundation, granting to grassroots organisations who design and run projects that meet the needs of Greater Sydney’s local communities.